Why Qatar for your next business event? Qatar of the United Arab Emirates, with its capital city Doha, is situated centrally between Europe and Asia, bordering Saudi Arabia to the south. Qatar has invested heavily into its tourism infrastructure, including the construction of luxury hotels, resorts and meeting facilities. With 65% of visitors to the country there for business purposes and a high number of four and five star hotels, Qatar is already a leading world-class high-end events destination for the Meetings, Incentives, Conferences and Exhibitions (MICE) sector, with a reputation for quality and excellence. Qatar Tourism Authority’s Strategy 2030 aims to achieve a 10% annual growth in the number of business visitors by 2018 and to provide the infrastructure to support that growth, with up to 62,000 rooms expected by 2030. Doha’s popular Corniche, the old city centre and the West Bay business district can easily be reached within 20 minutes’ drive from the award winning Hamad International Airport, which opened in May 2014 and is just 14 km from the city centre. Most hotels will arrange airport pick-ups and drop-offs. Various car-hire agencies have kiosks inside the Arrivals terminal, and metered taxis are readily available outside. There is a steadily improving public transport system in Qatar, particularly in Doha, where there is a public bus system. A metro system is under development. Qatar has two large convention centres. The impressive Qatar National Convention Centre, a 20 minute drive from the central business district, opened in 2011. It has a variety of meeting rooms and event spaces with integrated conservation and energy efficient features to house from 25 to 10,000 guests. The Doha Exhibition and Convention Center is located in the heart of the West Bay business district. It offers state of the art meeting rooms as well as one large open space of 29,000m² which can be divided into five vast, pillar-free halls. For a team building or training session for about 50 people we would recommend the 5 star luxury Oryx Rotana. With its range of extensive meeting room facilities this hotel is located near to Hamad International Airport. Alternatively the centrally located Millennium Hotel Doha, a 25 minute drive from the airport, allows easy access to Doha’s main attractions. 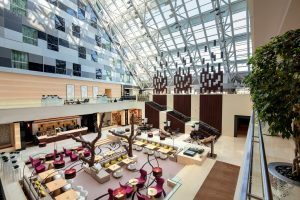 For a small meeting of about 10 people we suggest the Sheraton Grand Doha Resort and Convention Hotel or the Movenpick Hotel West Bay, both located on the West Bay waterfront. Qatar offers an engaging natural environment to explore. The surrounding desert provides a great deal of interest and adventure for sand safaris and visits to such natural landmarks as the 40m deep phosphorescent cave at Dhal Al Misfir and the Singing Sand Dunes. In Doha itself, a pleasant afternoon can be spent strolling along the landscaped waterfront promenade, which provides paved and grassed areas popular with walkers, joggers and picnickers. Several hotels, government ministries and the Emir’s Diwan are located along the route and traditional wooden dhows are moored in the harbour. At the harbour entrance is the famous pearl monument, a reminder of Qatar’s pearling heritage and a popular spot for photos. Also accessed from the Corniche is Souq Waqif, tastefully redeveloped over the last decade to resemble a 19th century souq, with attractively restored original Qatari buildings and the neighbouring Falcon Souq. Al Rumeila Park and the Qatar National Theatre are also nearby. Katara Cultural Village contains purpose built buildings that display the region’s architectural heritage, with venues that stage a year round programme of concerts and exhibitions. One of the city’s main attractions is the magnificent Museum of Islamic Art, located on the Corniche. A stunning building itself, this houses a collection from Asia, Africa and Europe spanning 1,400 years and would be an excellent addition to any social programme. There are a variety of excellent dining opportunities in Qatar, including Michelin star chef Vineet Bhatia’s Saffron Lounge. Located in Katara, this was the first Indian restaurant to open in Qatar. We also recommend Opal by Gordon Ramsay, situated in The St Regis, West Bay. 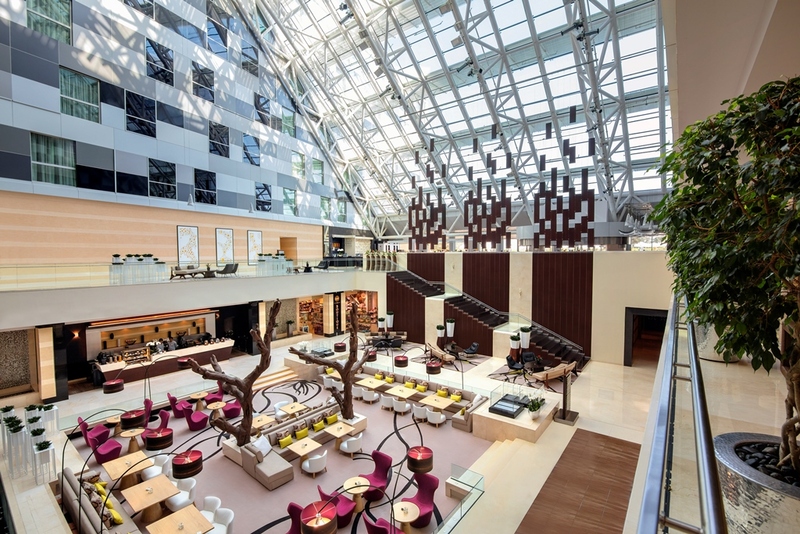 One hotel we suggest that offers the ‘complete package’ of excellence for the business visitor in accommodation, service, food and facilities is the 5 star luxury Four Seasons Doha. Located on the seafront yet in the heart of the city, this hotel combines business efficiency with beachfront resort relaxation. With such a wealth of business facilities available both now and in development, Qatar has to be a consideration for any business meeting or conference. See Bien Venue’s website for how we could help you to plan your next event.